Eyes are essential for taking in the ride. For pleasure, safety, and performance. Protecting them from airborne detritus, dust, dirt, and moving air keeps them safe and healthy. Highly-evolved lens tints improve performance. Filmmaker Frederico Fellini once said, “If you see with innocent eyes, everything is divine.” And keeping that kind of perspective is what Oakley does with every pair of glasses they make. They make the world look better. Whether it’s a single lens shield or a two-lens frame, Oakley has been building sunglasses as performance components since 1984, when they introduced their game-changing Eyeshade. Greg LeMond helped popularize it in 1985, virtually creating the sport sunglass market. Since that first sport-specific glass, Oakley has been making shades that protect your eyes, stick to your skull, improve your ability to see and make you look good all at the same time. You never do you have to choose between fashion and function; they do both, though if you lean a bit more one way or the other, they’ve got options. Oakley covers all the bases, and even tweaks lens characteristics for specific kinds of riding. A brief tour of what Oakley does and how they do it should get you thinking of how you want to protect your eyes and with what. The reason you wear eye protection is, foremost, for what the lens offers. Having lenses protect you from objects, both moving, like gravel, and stationary, like the ground, is the first thing. Oakley created Plutonite for this reason. It can withstand both high velocity and high mass impacts. Lenses are impossible to shatter and nearly as hard to crack. But it also needs to protect your eyes from the sun. To deal with that glowing orb in the sky, Oakley lenses filter out 100% of UVA, UVB, UVC rays, and blue light up to 400nm with all their lenses—this isn’t a coating applied on top of the lens, but built into the Plutonite. And it needs to be distortion-free; that’s why they developed High Definition Optics (HDO). But merely protecting eyes isn’t enough. Creating lens tints that improve vision by filtering out light is the next step. Oakley has many, tints available, as well as polarized, photochromic, and clear to meet all your vision needs. What they’re most proud of is their new Prizm technology, which is their ability to tune the lens tint to enhance vision. Prizm is designed both for everyday use, with the Prizm Everyday, as well as specific environments, like those found road and trail riding. Prizm Road lets in 20% of light, increases contrast and improves color separation for you to better see potholes, road lines, and get better depth perception. Prizm Trail lets in 36% of light, and is optimized to separate greens and browns and oranges as well as increase contrast, making it easier to pick a line because you’ll be better able to tell if the ground is wet, damp, dry, or loose. Oakley pioneered the concept of Three-Point Fit, the idea that glasses should only contact your head at three points: the nose and behind the temples. This means they rely on a strong but flexible plastic for the frames and their Unobtanium rubber for the contact points. The former flexes predictably to fit different shaped heads, while the latter grips well when the head is dry, and better when it’s soaked in sweat. The Unobtanium nosepiece is removable, and most models come with a different-sized interchangeable spare, to customize the fit. The arms are often adjustable, with a number of models coming with spare arms of different lengths to dial in the contact point. After the frame is comfortably on your head, the next part of the fit is lens(es) shape. Try them on and see. They have lots of shapes and sizes. In most cases, the ideal is the widest coverage you can get without contact at the brows or cheekbones. There are no Oakley sunglass models that are solely for performance or style. They all have both. For a long time, single-lens shields were seen as on-bike only. Now, they are fashionable on the bike, walking the runway, and relaxing at the café. Which is to say follow your bliss; the only rule is what’s right for you. There are fourteen different model families within the 65 different glasses they offer in their Sport Performance range, with most coming in several colors and featuring multiple lens options. If you narrow it down to what they consider cycling-specific, that’s still 40 options. There’s at least one pair, if not several that meet your fit, performance, and style needs. To make it simpler, we’re highlighting a few styles. If you prefer dual-lens eyewear, Oakley has many models in the Flak and Jacket lines, which is the name that is bestowed on many of their dual-lens offerings. There are multiple sizes and shapes, with options for both full-frame and half-frame models. Some are designed for regular lens changing, with locks and jaws to make swapping easy. The most advanced of this pack is the Field Jacket. It has all the features you’ve read about, including interchangeable arms and a spare nosepiece, plus a new trick. That feature is called Advancer Technology. It’s essentially a little lever on the nosepiece that moves the glasses forward a few millimeters, allowing more air to flow under the glasses in high-sweat situations while still providing maximal eye protection. Flip the lever if you ever start fogging up, then, once you pick up speed, flip it back. In terms of single-lens shields, Oakley pioneered the design and has never strayed from further improving it. They started with the Eyeshade, then Blades, M Frames, Radars, EVZeros, Jawbreakers, Sutro, and Wind Jacket 2.0. Add to that list the Flight Jacket, which switches the orientation of the frame from above the shield to below. The change might seem small from afar, but it was responding to a persistent complaint from cyclists and a significant design challenge. Essentially, many cyclists reported wanting to have the top edge clear to have no obstructions when low on the bike and rolling their eyes up to see down the road and trail. Like the Field Jacket, it also possesses Advancer Technology, interchangeable arms and nosepiece. Whatever model you choose, the glass comes with at least a microfiber bag that doubles as a cleaning cloth. Most come with a soft vault, as well as a spare nose piece. Some come with interchangeable arms, and a few come with a second lens. While you should start with the lens you expect to be using most of the time, consider getting a second lens for different light conditions. If you ride both road and mtb, having a lens for each could be helpful. If you occasionally ride around dawn or dusk, a photochromic lens can come in handy, and Oakley’s Clear Black Iridium Photochromic varies from letting 69% to 23% of light through. If you ride at night, a clear lens, which allows 93% of light through is good. If you ride in bright conditions or ride at high altitudes, something that allows in less light, consider Prizm Jade, which allows only 14% light and has increased contrast both improves your ability to see what’s in front of you and takes strain off your eyes. On the other end of the spectrum, Prizm Low allows in 75% of light and with the rose base, brightens while increasing contrast. You change clothes depending on the weather; your eyes deserve the same consideration. 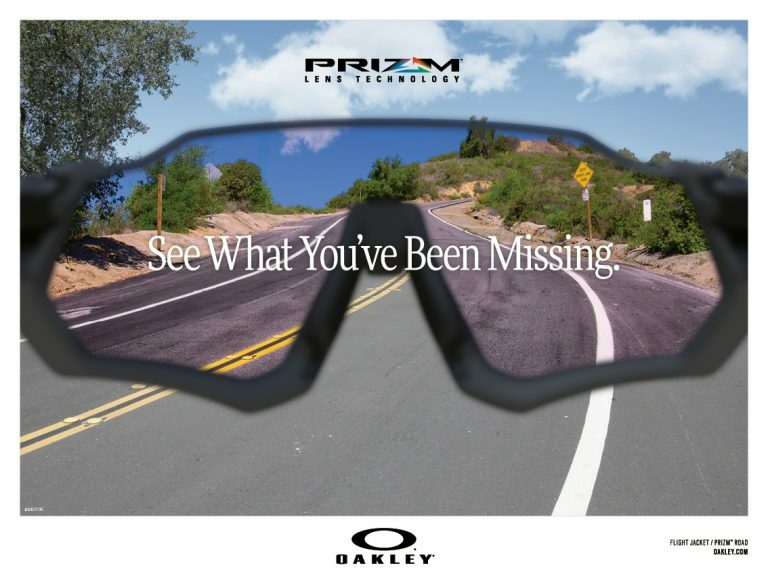 No matter what you ride, how you ride, and where you ride, Oakley has an eye protection solution that keeps your peepers not only happy, but improves your performance as well.